In their run through 2018’s The Basketball Tournament former Cougar hoopsters Charles Abouo, Jimmer Fredette, and Brandon Davies relived the glory days from seven years ago. Photo by A.J. Rich. It was like 2011 all over again. 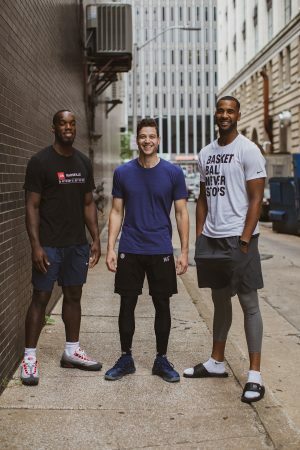 James “Jimmer” T. Fredette (BA ’16), N. Charles Abouo (BS ’12), and Brandon J. Davies (’13)—three of the guys who made magic seven years ago taking BYU to No. 3 in the NCAA polls—reunited this summer in ESPN’s The Basketball Tournament (TBT), a stack-your-own-team, winner-take-all tourney with a $2 million pot. Jimmer—the man, the legend, the verb—topped the TBT in scoring, and the team advanced to a Final Four game with all the echoes of 2011: Davies put down coast-to-coast dunks; Fredette made back-to-back threes. Team Fredette lost, 76–80, but the BYU nostalgia was flowing online, in the stands, and on ESPN primetime. “It’s just natural to play on a team with them again,” Fredette says of Davies and Abouo. Catch up with these Cougs at magazine.byu.edu/TeamFredette. The new Hall of Honor has everything Cougar fans need to relive their favorite BYU hoops memories.